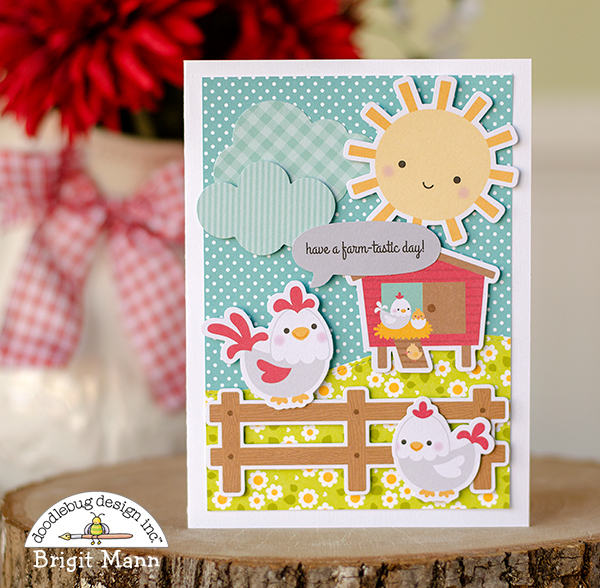 Down on the Farm is by far one of my all-time favorite Doodlebug collections. 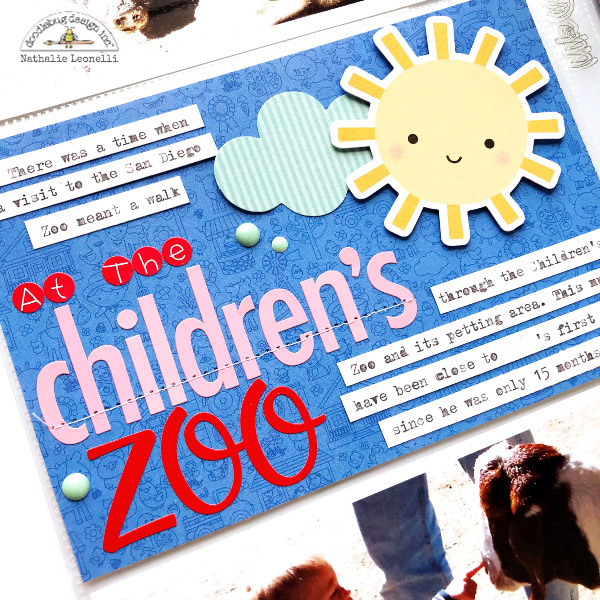 The farm animals are totally adorable and the papers are just so darling. A lot of times I like to create scenes for my cards and this collection made it so easy to put these together. 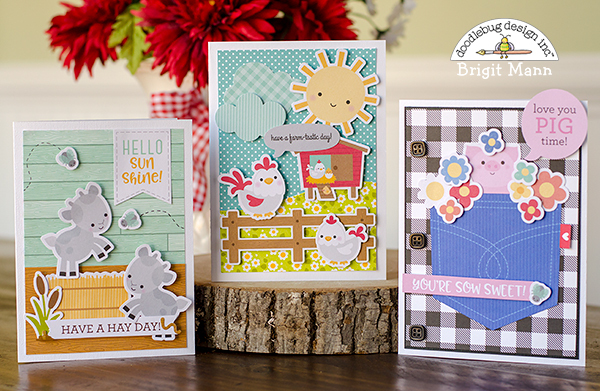 There's a good assortment of sentiments so you can come up with cards for all kinds of occasions. 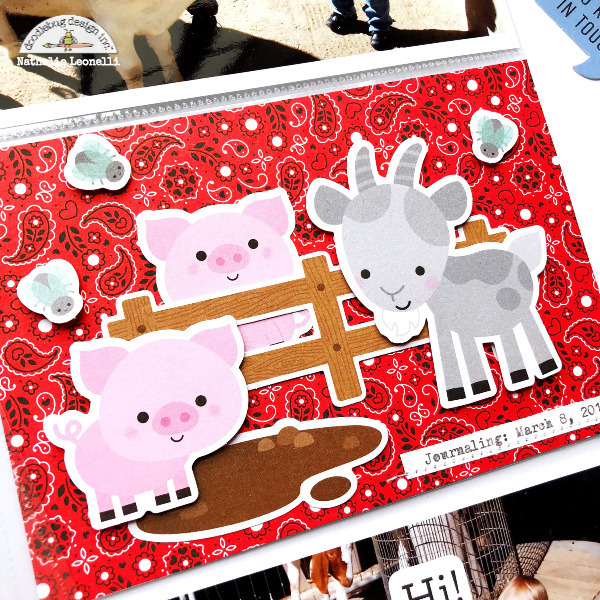 The pocket paper from the red bandana sheet is adorable, I knew I wanted to cut out one of the pockets and have a farm animal popping out with flowers. The buffalo check paper was perfect for my shirt theme, love that paper! 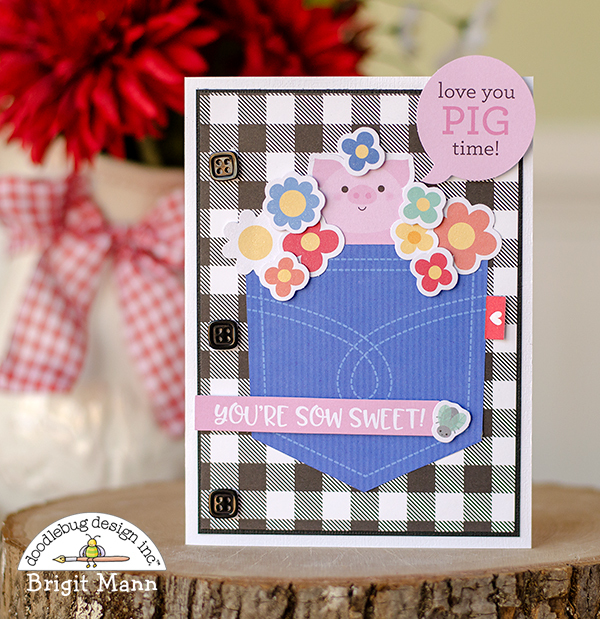 The pig, fly and flowers are from the odds & ends pack and speech bubble and sentiment is from the chit chat set. The buttons are from the beetle black boutique button pack. 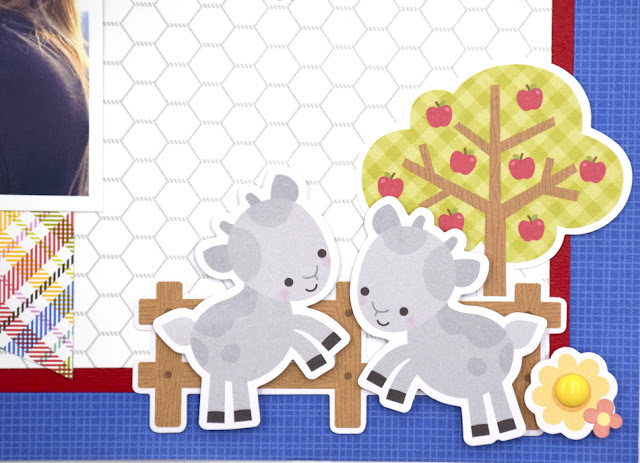 The flower side of the counting sheep paper is so pretty, it makes such a nice hill of flowers for my scene. This card is made up of more odds & ends and chit chat speech bubble. 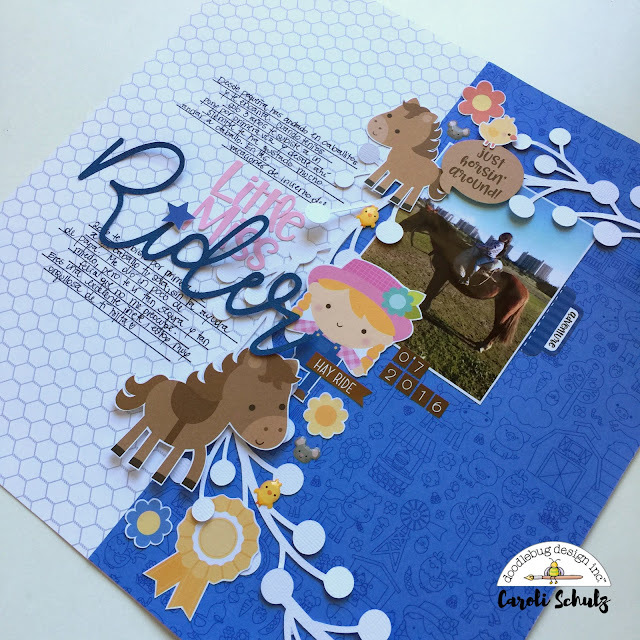 The top paper on the card is from the rainbow swiss dot petite print assortment pack. 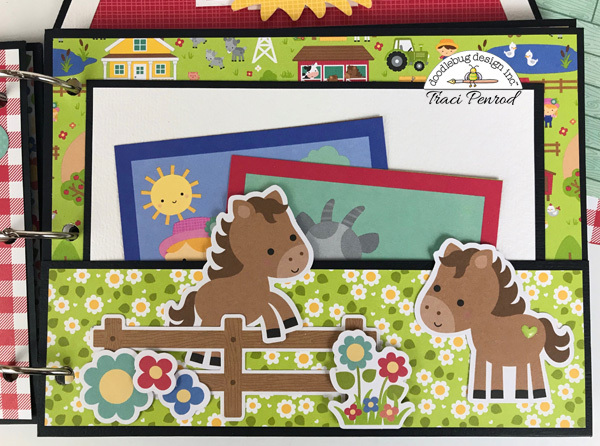 The country garden paper has pretty flowers on one side and this fantastic wood grain board pattern on the other, for the bottom part of the card I used the woodgrain horsin' around sheet. For the rest of the card I used odds & ends, chit chats and a couple of worms from the hens & chicks shaped sprinkles. Well I hope you've enjoyed these cards, thanks for stopping by and have a wonderful day! I love this spread and I can not believe that my little blond head is now 16! Yikes, time flies! 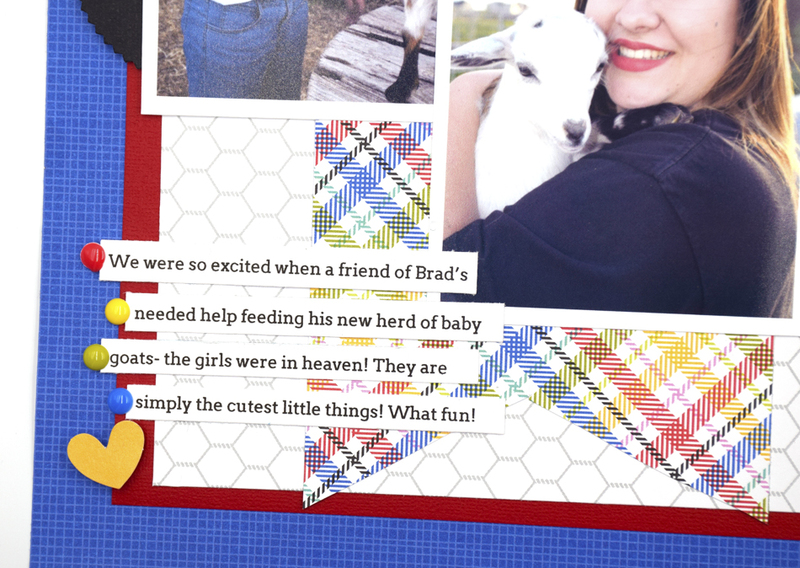 If you make pocket pages with Down on the Farm and share them on Instagram, make sure to tag me! I would love to see them! 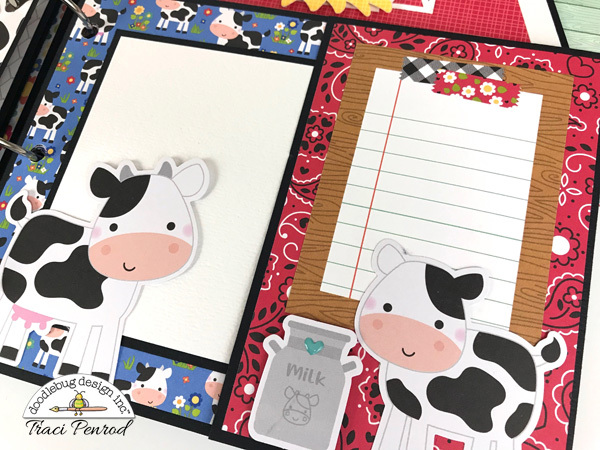 Today I’m sharing a layout of a cute little moo cow that was being raised on the agricultural farm at my daughter's school. Just the cutest little moo you ever did see and stolen the hearts of all the kids. 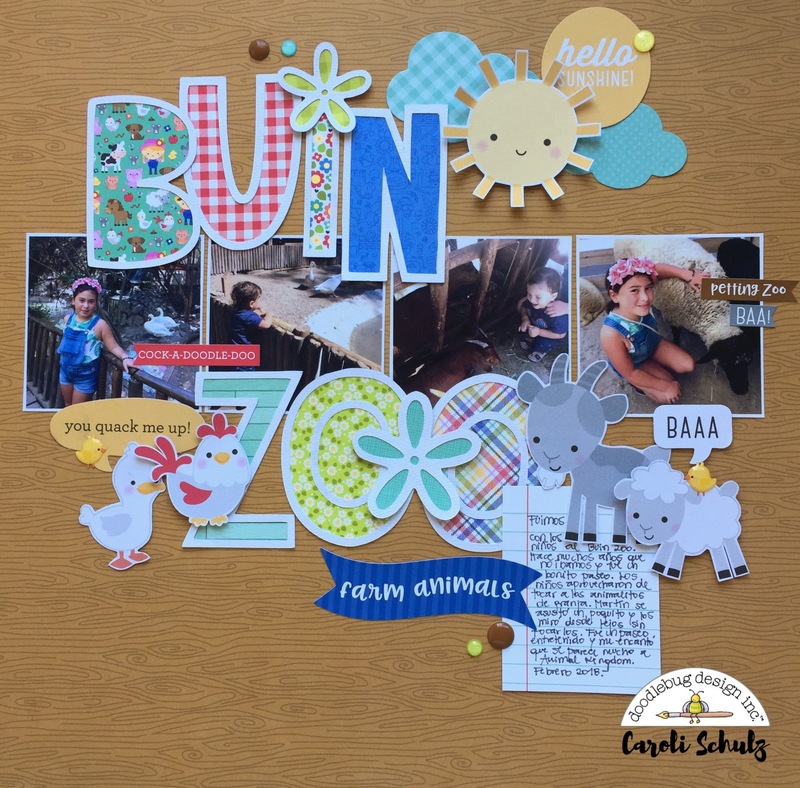 I went with a soft colour palette with this layout starting with my white cardstock and adding a strip of chicken coop across the middle of the layout. Then using the 'This & That" sticker sheet I added 2 border stickers to the bottom of the strip. 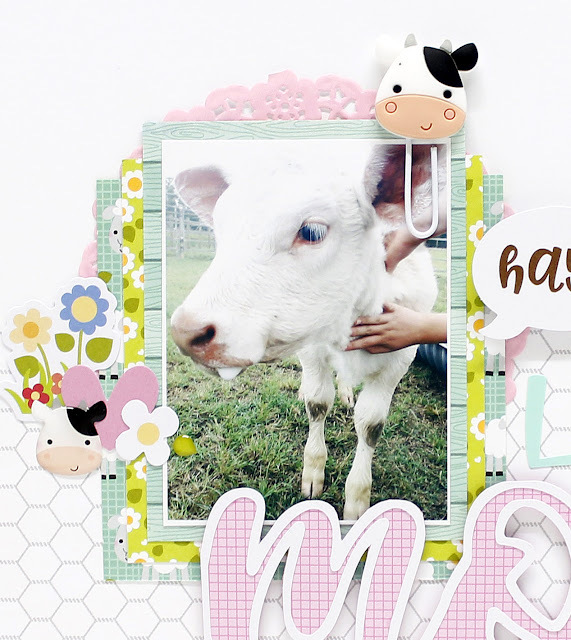 Then I layered Country Garden and Counting Sheep patterned papers underneath my photo and a pink cupcake doily behind the layers. 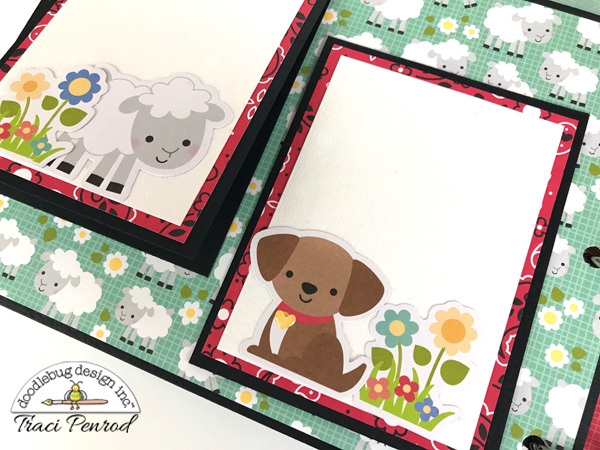 I used one of the brand new farm friends jelly clips and used some of the die-cuts from the Odds & Ends pack to create a little cluster of flowers and a heart. 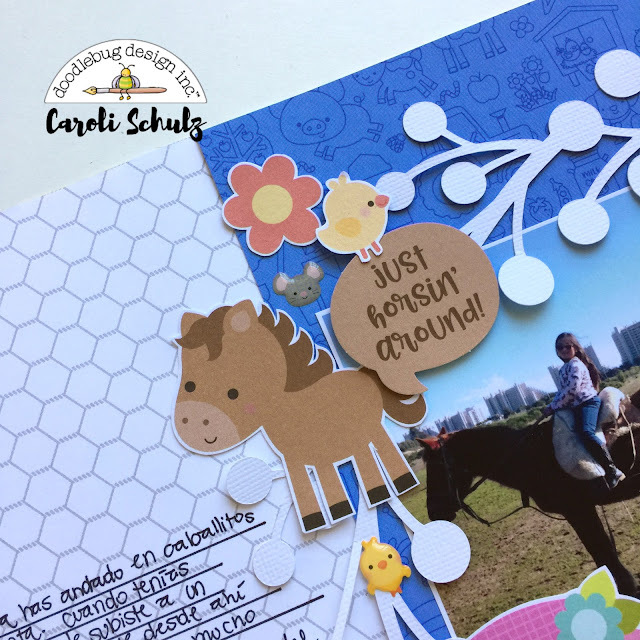 Using a chit chat bubble from the Odds & Ends pack to start my title I then followed with the mint Abigail alpha stickers and my cameo to create the remaining words. Then I added another cluster of flowers at the bottom of the chicken coop strip to finish it off. 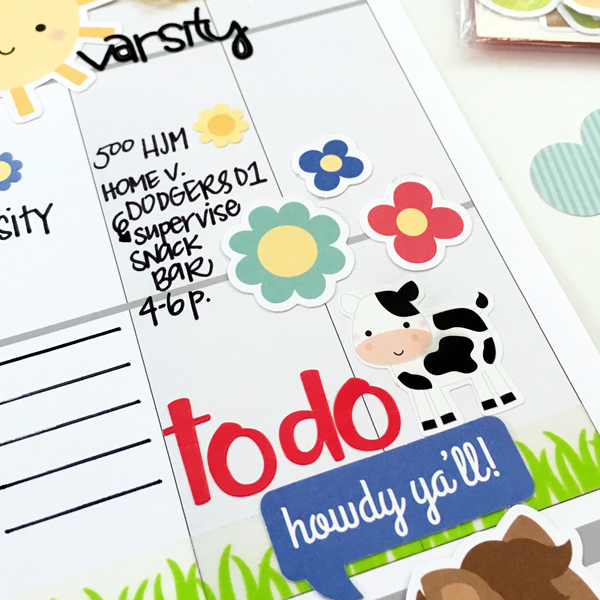 I love it when I can add such fun decorations to my functional planner! That is where the Doodlebug Down on the Farm goodies come in! I was able to set several scenes through out the page without losing even one bit of room. I can still get in all of the important things! See? 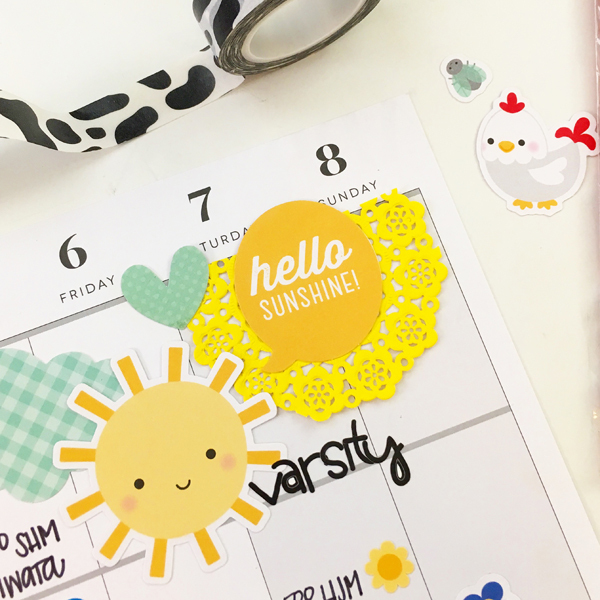 To Do lists and meal planning all in one spot - loving those Teensy Type alphabet stickers, they do their job AND look cute, right?! Also, the small little flowers make the perfect bullet points -- they are cute AND help the activities stand out. See? Decorating for a birthday is so fun - loved this scene in my planner. It was super fun and totally fit the occasion! Adding the doily to the mix really gives the page a little bit of texture but isn't a problem at all! 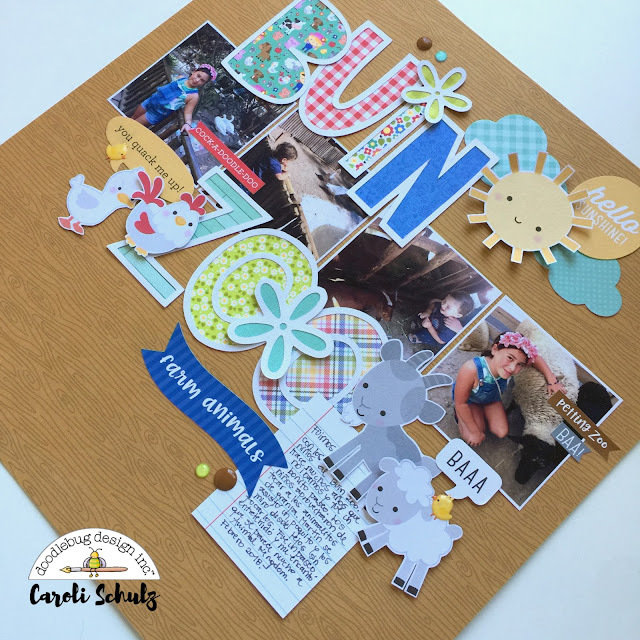 It layers under the Chit Chat and just makes the cluster of embellishments/die cuts even more special! Would you like to see how this layout came together? You can see the PLAN WITH ME VIDEO RIGHT HERE. You know, sometimes I have to admit that I have favourites. I know it's not right, but if I am being honest, I can't help myself. And the truth is that this new Down on the Farm collection is already on the top of my list. I mean really, does it get cuter than this? I was given the task of putting together a card set to showcase this collection - I know, tough job, right? 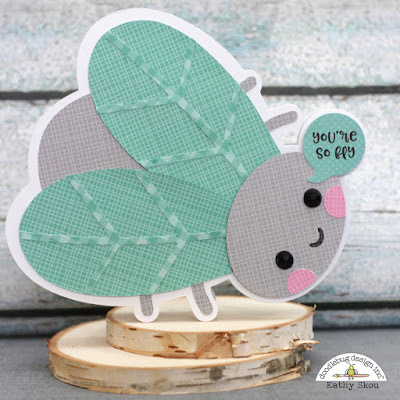 So immediately set to work putting all the cute Odds and Ends die cuts out on the table together with the clever chit Chat sentiments. ...and the best little worm ever! Add these to any card and your recipient will be smiling at all the details for days! And since we are talking favourites, I have to admit that I am a sucker for a great interactive card! And when I saw this denim jean pocket paper and the bandanna paper in the 12x12 collection, I knew exactly what needed to happen! That's right, the bandanna pulls out for a little hidden message. 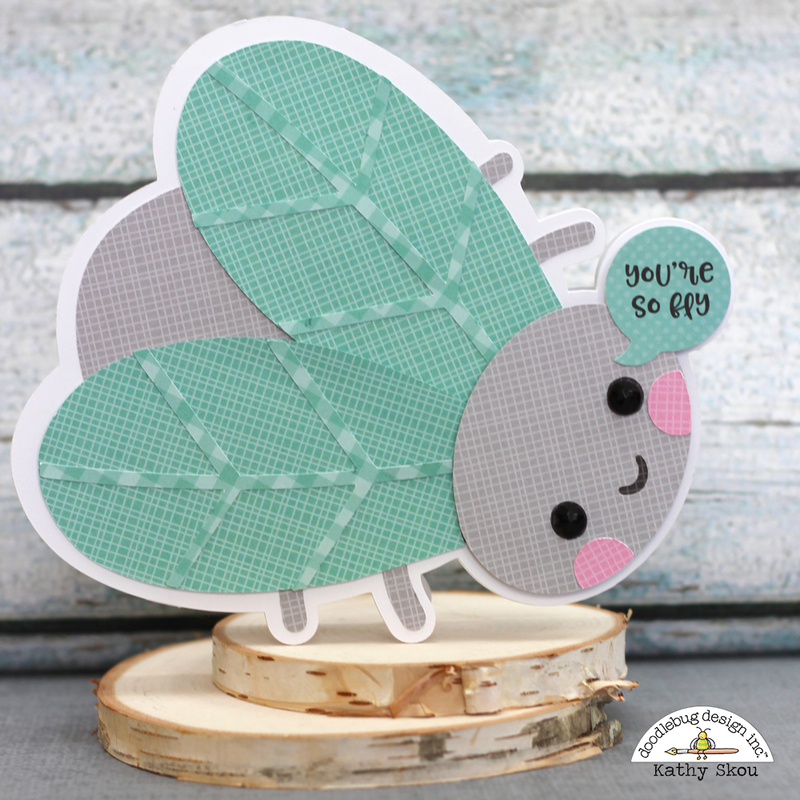 And while I chose to add some more pieces from the Chit Chat pack, a personal sentiment here would also work really well! 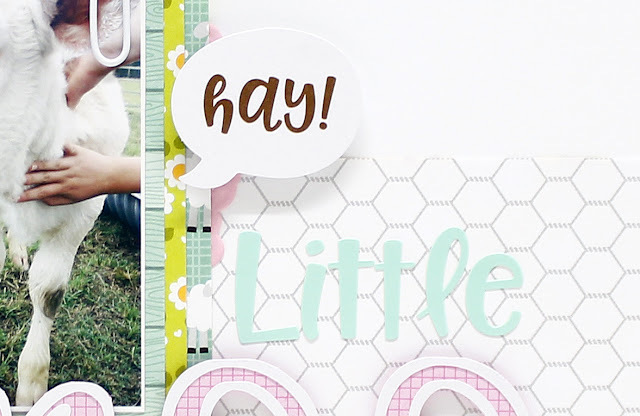 These files are just so stinking cute! I used Gingham Linen Petite Prints for these cards, the colors are perfect, and the sentiments are from the Down on the Farm Chit Chat Pack. Here are some close-ups.. 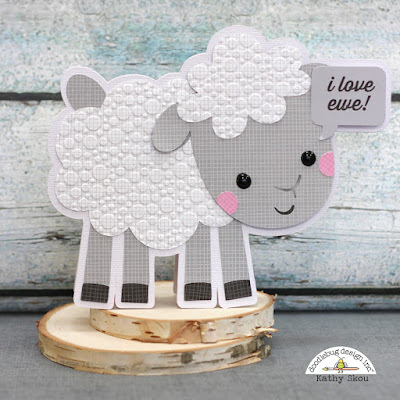 This card was made using the Lamb file. I used an embossing folder to make him appear a bit more fluffy and added some Beetle Back Sprinkles for his eyes. 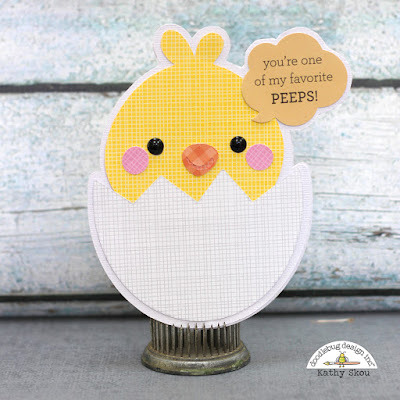 .I just love this little chick in the egg... he's soooo tweet! (sorry, couldn't resist) I used the Chicks file for him. 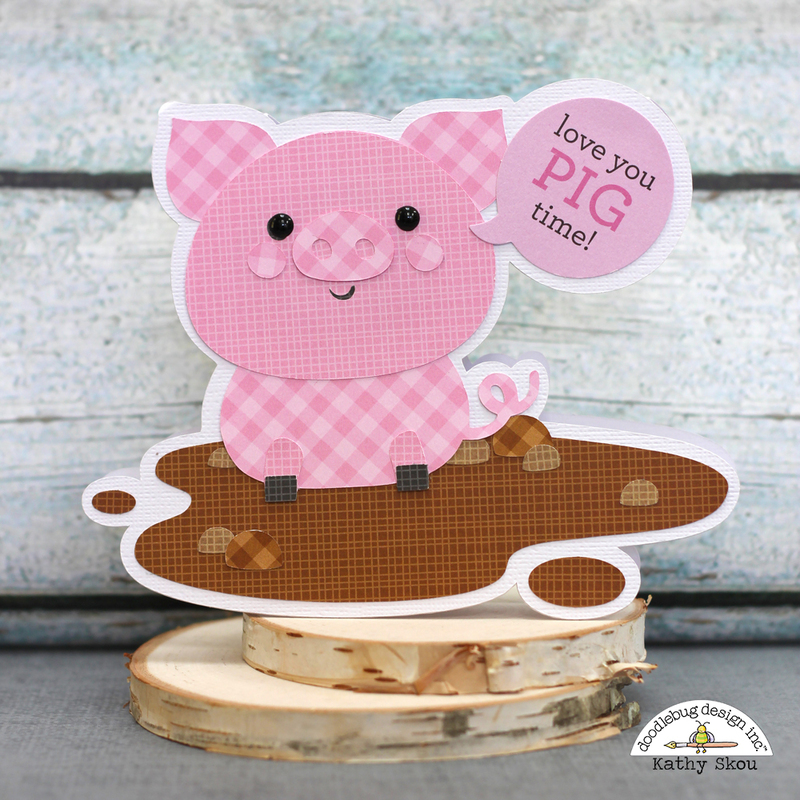 This little pig in the mud puddle just makes me smile. He was created using the Pig #3 File. The cow was actually the first card I created with the files. 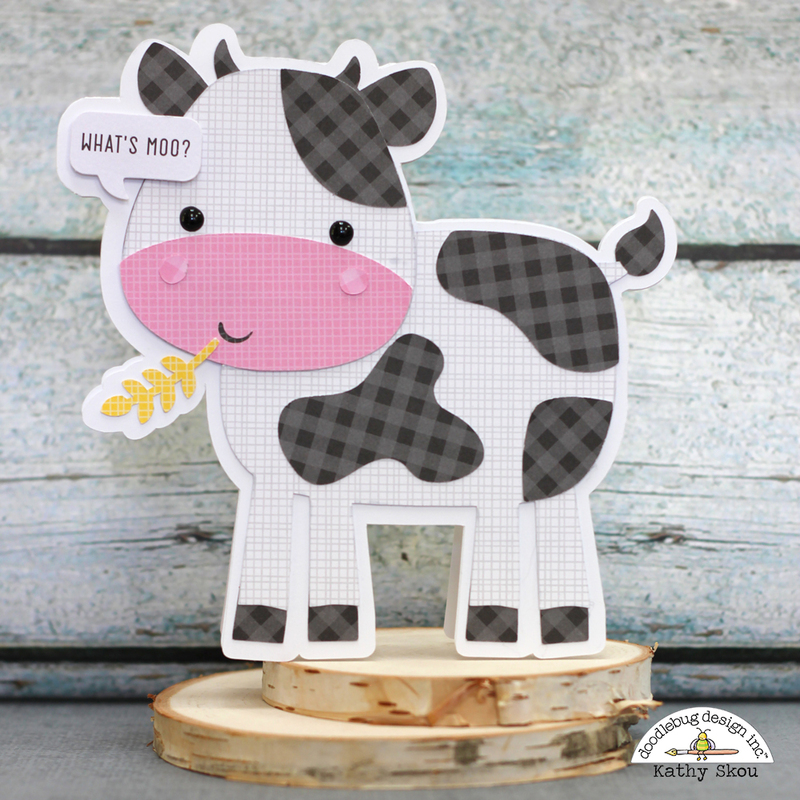 I love his cute face and the What's Moo sentiment makes me laugh every time I see it! He was created using the Cow #2 File. I had such a fun time making these cards! That's it for me today, thanks for stopping by to peek! 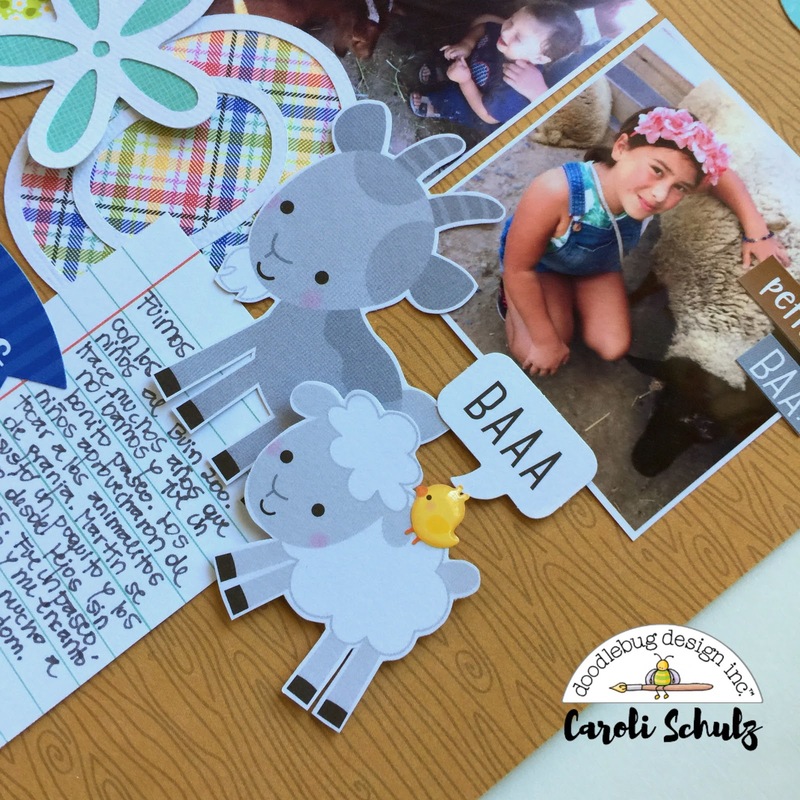 Being an avid animal lover, I was so happy to have some absolutely adorable Doodlebug farm animals to use on some of my layouts. 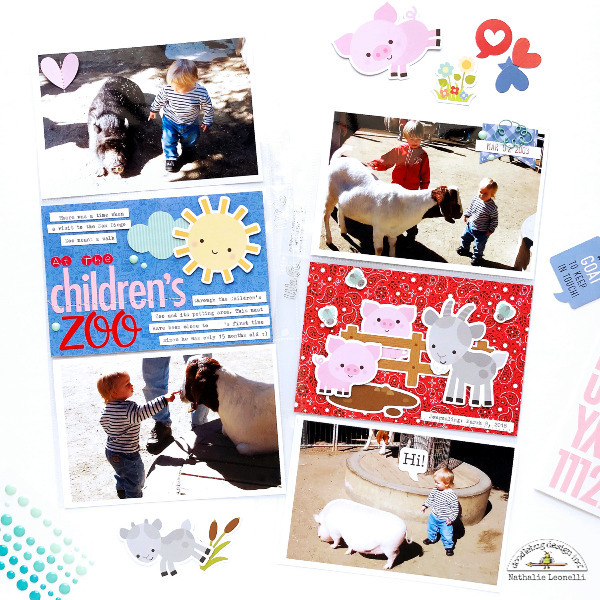 The animals are truly the cutest and I loved using the little goats on this fun layout of my girls feeding some baby sheep one day. To make my layout I started out with a piece of Blue Jean Gingham/Linen paper. 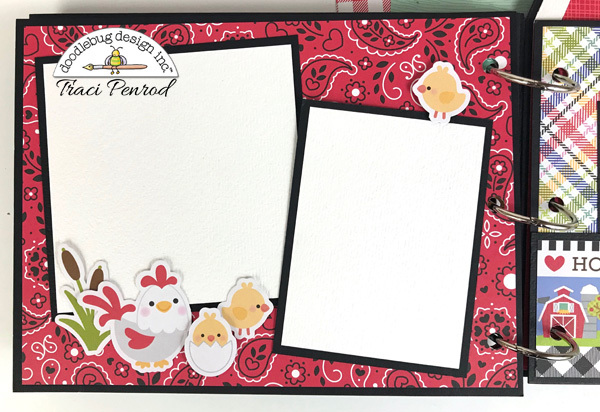 I cut out a square from the Chicken Coop paper and mounted it on some red cardstock. I cut a piece of Horsin' Around paper on the woodgrain side and glued it to the paper. I cut a banner shape from the Farmer Flannel paper and added that to the page. I cut a scallop border using a Silhouette cut file from some black cardstock and glued it under the bottom edge of the wood paper. I then added my photos to the layout. I added a cluster of the goats, a wood fence, a yellow flower and an apple tree from the Odds and Ends. I added a small peach flower and a bright yellow sprinkle to the center of the flower. 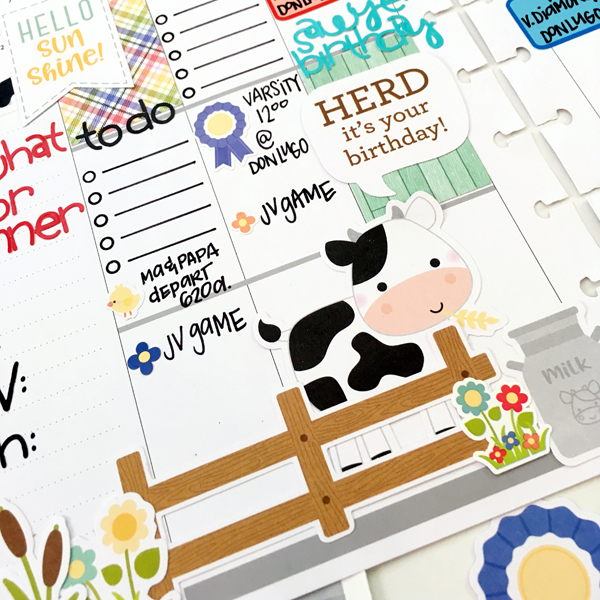 I added my journaling in strips on white cardstock and then added a few different colored sprinkles to make bullet points. A bright yellow heart from the Odds and Ends is also in this corner. 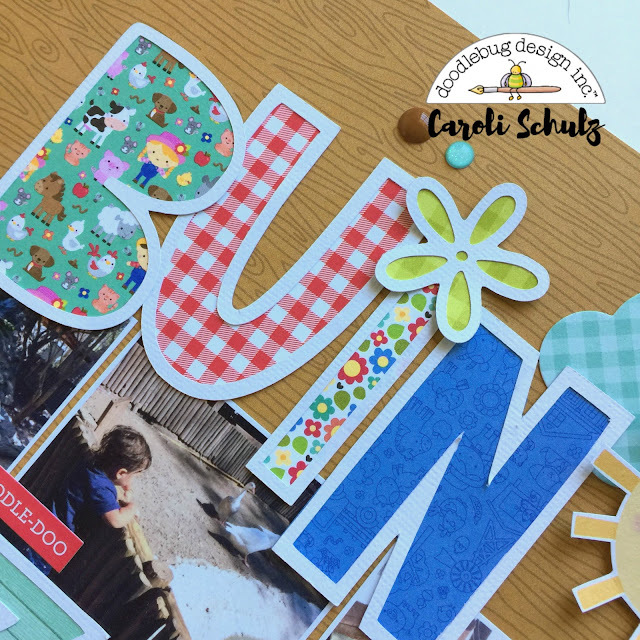 To make my title I turned to my trusty Silhouette and cut out some letters using the Arvo font and some Ladybug Abigail stickers. I also added some die cut and sticker hearts. 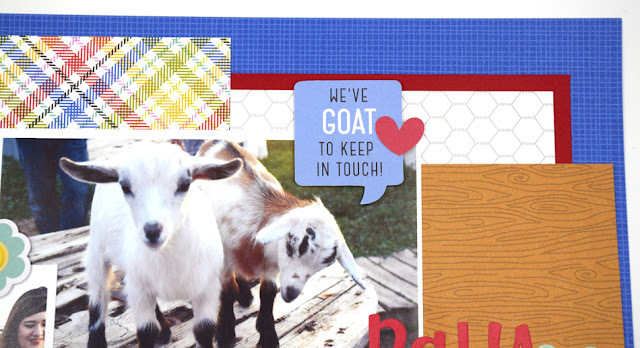 I used foam tape to pop up the "goat" word for some added dimension. 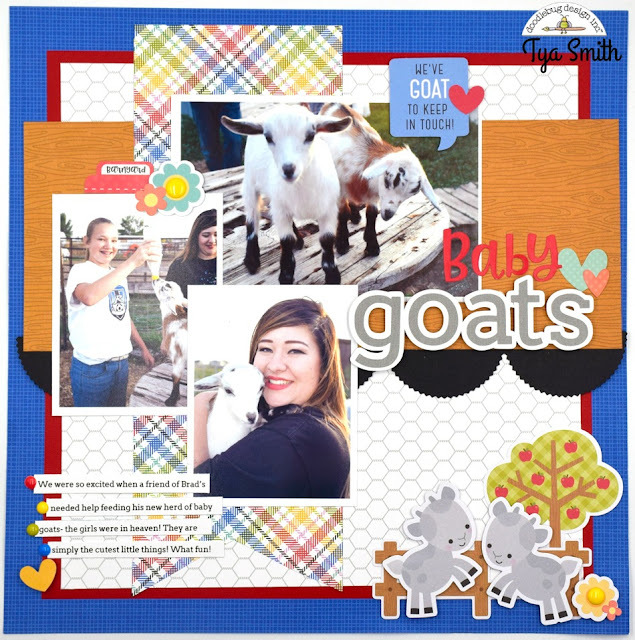 The Chit Chat pieces of this collection are especially fun and so I located the one that was goat themed and added it to the top corner of my photo. Another heart die cut embellished this section. This was such a fun layout to put together! 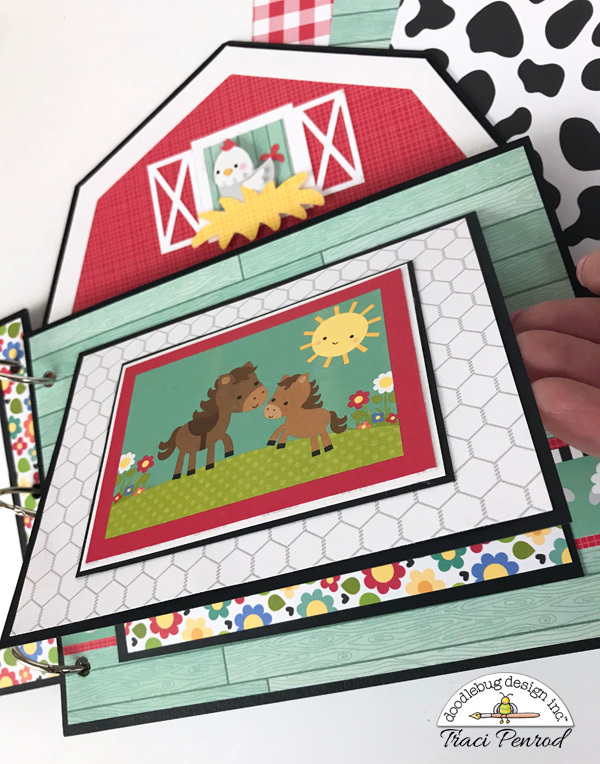 From the adorable icons to the bright, happy colors - I loved using the Down on the Farm line to record this memory. 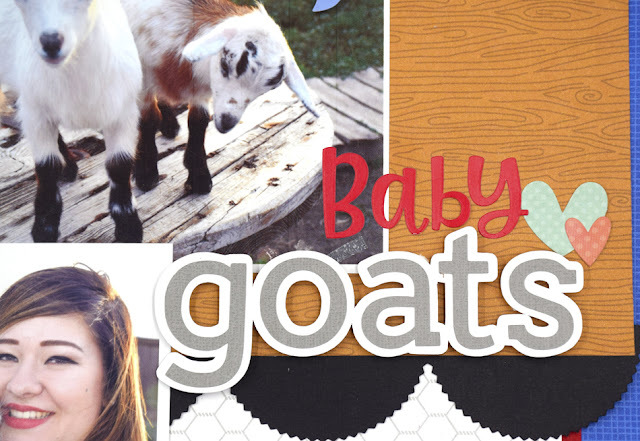 I hope I have inspired you to find some cute animal pictures and pick up this cute collection today! Happy Crafting! 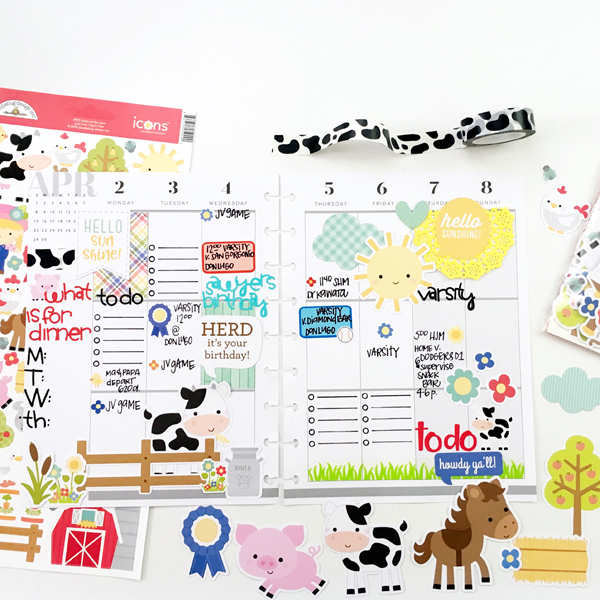 When you look up the word 'cute' in the dictionary, it should have a picture of the entire Down on the Farm collection next to it. I mean seriously, there is nothing about this line that isn't just completely adorable! 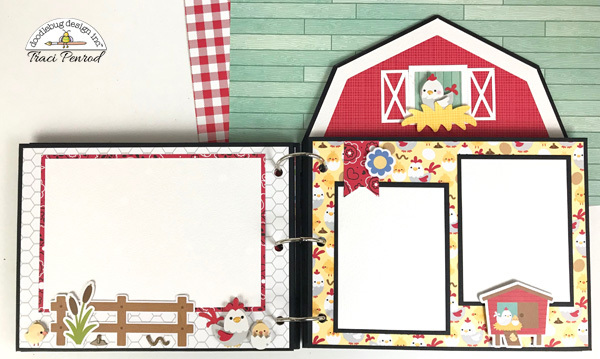 I had so much fun creating this barn-shaped mini album and I just couldn't wait to share it with you! 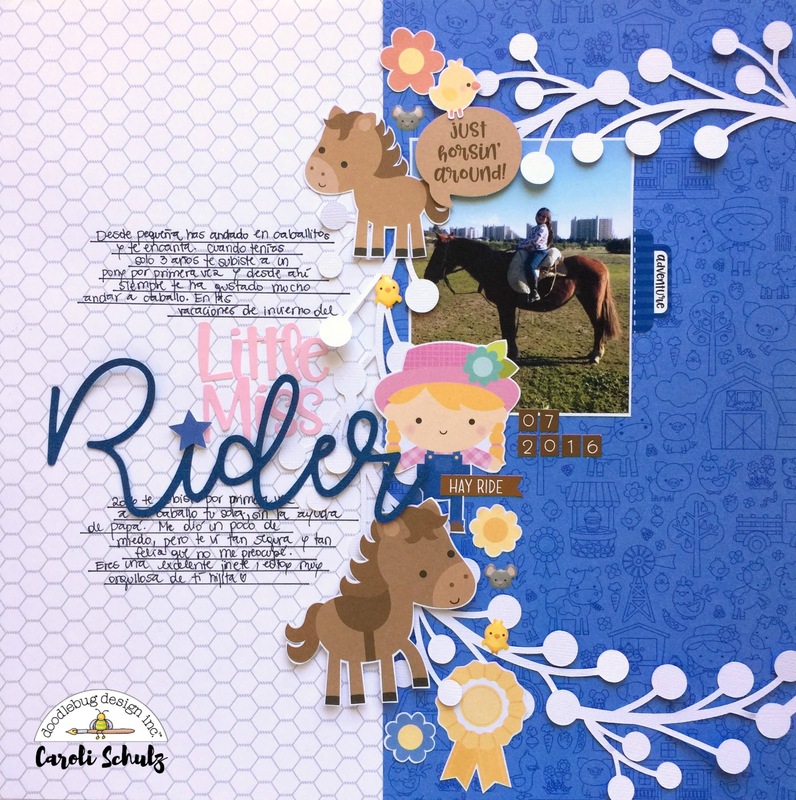 I used the Doodlebug barn cutting file, and modified it a bit so that the album would fit across the bottom. 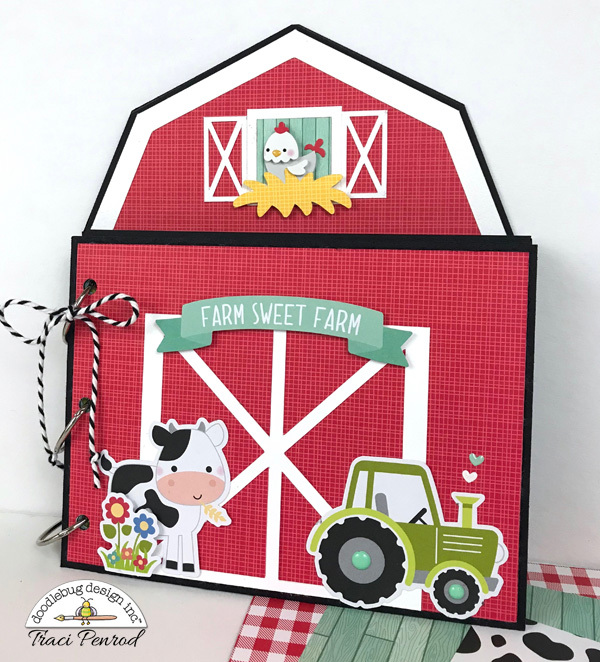 That sweet little title banner above the barn door is from the chit chat pieces, and the other darling die cuts are odds & ends. I just love the new 3x4 cards ... they are perfect for the front of this flip-up card (above) and for tucking into a pocket (below). Remember the newly released tiny heart sprinkles? You'll find them scattered throughout the album too. There are so many precious new Doodlepops, but my favorite is the Hen & Chicks! That little worm just kills me! This fun album will be available as a DIY kit in my Etsy shop. For more information, you can visit my blog at Artsy Albums. Thank you so much for visting the blog today! I hope you enjoyed my mini. Check out all of the Down on the Farm cuteness here. I must confess that when I saw the new "Down On The Farm" collection for the first time I loved it, but realized I had not many farm themed pics (we live in the city and don't have any chance to experience farm life). 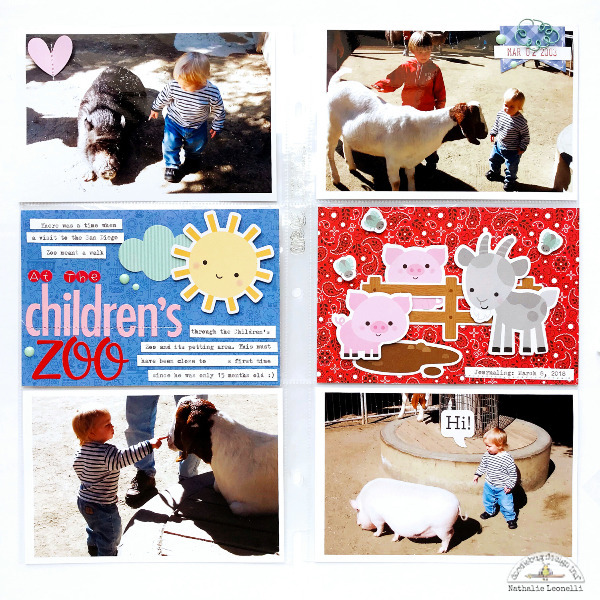 So I decided to organize a trip to a local zoo where the kids had the chance to pet some farm animals. Please tell me I am not the only one who organizes family activities with scrapping in mind, LOL! I used some die-cuts from the Odds & Ends pack and also some fun pieces from the Chit Chat pack, love them! 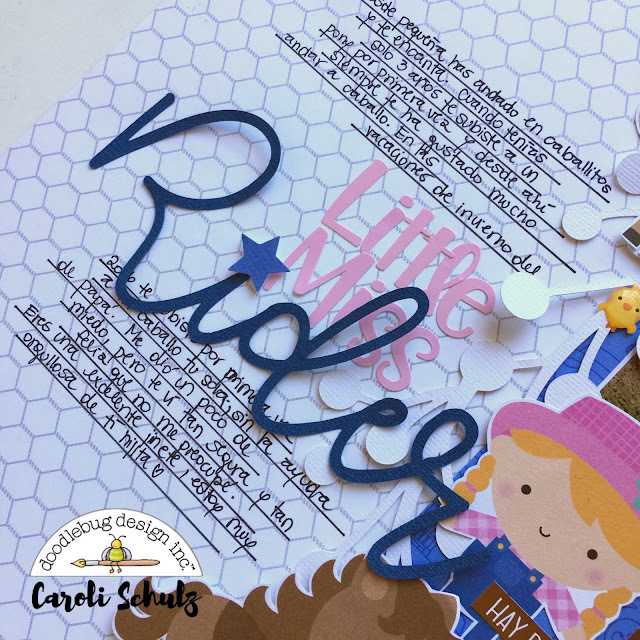 I used a cut file from The Cut Shoppe to create my title, and patterned paper from the 6x6 'Down On The Farm' pad to fill the letters, I was able to use a lot of the patterns but please that it doesn't look busy. 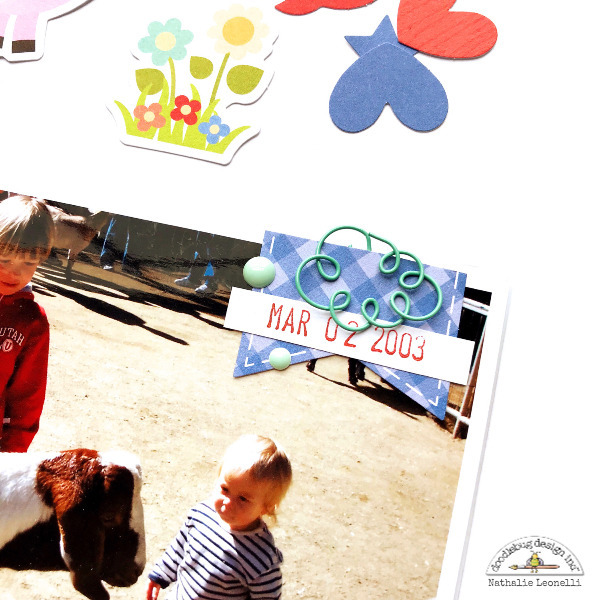 My second layout features a pic of my little girl, who loves horseback riding. She has been riding horses since she was three, along with daddy, and last year finally started riding on her own. I'm so proud of her! 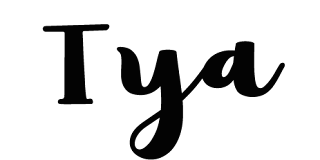 I created my tittle using some Abigail alphas and also I cut the word "ride" using Better Together free font. I like the combination of big and little words and different fonts. 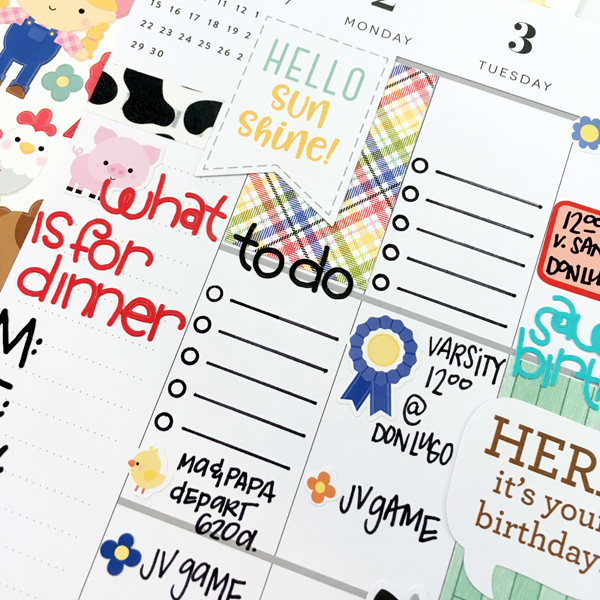 I hope you liked these layouts and get inspired to work with this beautiful collection. See you on my next post!